The total cost of resolving asbestos claims has already reached 54 billion, and could rise to as much as $260 billion, according to the Rand Institute fo Civil Justice. Connecting You with Mesothelioma Lawyers Nationwide! We help asbestos and mesothelioma victims and their families file claims for asbestos related illnesses. We get you in touch with experienced legal and medical professionals. We have experience placing people with experienced asbestos and mesothelioma lawyers for six years. We will actually walk you through the process of connecting you with an experienced asbestos lawyer in your state. Asbestos Exposure is Responsible for 90,000 Deaths Annually. We help keep the public aware of new discoveries in treatments for Mesothelioma and Asbestos cancers. We also maintain a current online Mesothelioma Dictionary of Legal & Medical Terms and we keep you up to date on current legal settlements for asbestos cases. This site provides important information on asbestos & mesothelioma claims. We help mesothelioma patients and families make educated decisions about how to proceed with filing asbestos and mesothelioma claims. If you were unknowingly exposed to harmful levels of asbestos, you have legal rights and there is compensation help available for you. Mesothelioma Law firms that we work with concentrate only on asbestos mesothelioma cases. We have experience with placing people with experienced mesothelioma law firms for six years. We walk you though the process of connecting you with an experienced asbestos mesothelioma claims lawyer in your state. If you or a loved one has been diagnosed with mesothelioma, or a family member has died as a result, you may be entitled to recover compensation from the companies that made these asbestos products. It is not uncommon for there to be 10-20 parties that are named in a mesothelioma lawsuit that are located across the United States. For example, a worker in California may have been exposed to asbestos from asbestos products shipped from Libby, Montana or from an iron ore plant in St. Paul Minnesota. This is why it is very important to obtain an experienced mesothelioma claims lawyer that knows all of the companies in each state who have responsibility for your asbestos exposure. We have helped people with mesothelioma cancer for more than five years on the Internet. The Mesothelioma Help Center is designed to give you quick & simple answers about mesothelioma treatments, asbestos exposure, mesothelioma diagnosis, mesothelioma symptoms, mesothelioma doctors, and we can refer you to an experienced mesothelioma lawyer in who has successfully settled mesothelioma cases. For those diagnosed with asbestos or mesothelioma cancer it is very important to consult with an experienced mesothelioma lawyer. In most cases there are funds available for your treatment and personal suffering. 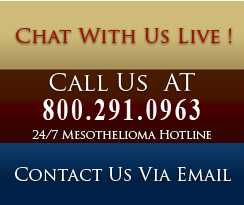 Call us Toll Free at 800.291.0963 or use our Mesothelioma Attorney Contact Form located on the right side of this page for a quick response.